Born of the U.S. government's 1928 raid on the degenerate coastal town of Innsmouth, Massachusetts, the covert agency known as Delta Green spent four decades opposing the forces of darkness with honor, but without glory. Stripped of sanction after a disastrous 1969 operation in Cambodia, Delta Green's leaders made a secret pact: to continue their work without authority, without support, and without fear. Delta Green agents slip through the system, manipulating the federal bureaucracy while pushing the darkness back for another day—but often at a shattering personal cost. In DELTA GREEN: THE ROLEPLAYING GAME, you are one of those agents. You're the one they call when unnatural horrors seep into the world. You fight to keep cosmic evil from claiming human lives and sanity. You conspire to cover it all up so no one else must see what you’ve seen—or learn the terrible truths you’ve discovered. 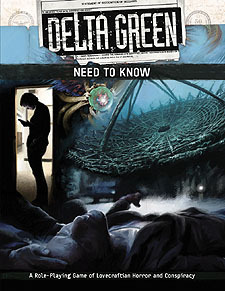 DELTA GREEN: NEED TO KNOW includes everything you need to play Delta Green. A Delta Green operation, "Last Things Last," ready for the Handler (the game moderator) to introduce your team to Delta Green tonight. A sturdy, four-panel screen loaded with data to help the Handler run a fast-paced, suspenseful game - and sinister wraparound art to keep the players terrified.